Cebu, Philippines – I can’t believe I am seeing you again after 5 years! After saying goodbye to Malin in Moalboal, I jumped on a motor trike for the quick 10 minute ride into Moalboal. I love the mopeds and trikes. This would cost me $10 dollars back home and here it only cost 100 pesos, about $3.10 CAD. Anyways, I am waiting in Moalboal for a bus, but today I decide to be picky and wait for a Aircon bus. We would call it AC or Air Conditioned bus. 3 buses pass, and then I see it, the AC bus, Wasn’t a bad wait, only about 35 minutes in 34 degree heat with a hangover. Sometimes I don’t make the best decisions the night before! I jump on and pay the extremely cheap fare. 116 pesos ($3.20 CAD) for a 4 hour bus ride. Find that in Canada. My seat buddy is a young Filipino, who is also sleepy like myself. I am not sure how, but he and I both sleep most of the ride to Cebu. So much so, that when we arrive in Cebu I was checking my GPS to see how much longer. I thought at least another hour. Nope, we are here. A 20 minutes taxi ride later I am at my hotel and checked in. I am loving my room, small, clean and has excellent internet. That night I just relax, and watch some TV, while I recuperate from my hangover. The one thing I did do is message an old friend from 5 years or more ago, from when I lived in Victoria, BC. Jessica is arriving in Cebu tomorrow and I can’t wait to catch up. How did I meet Jessica? Well when I lived back in Victoria, BC, I advertised for a house cleaner, and she was one of the few who responded. I can’t recall what about her resume stood out, but from the minute I met her, I knew she was an amazing person. Back then she was dating an Aussie guy, and was traveling back and forth from Australia to be with him. She was a young 24, but had already traveled all over the world. I remember one night, I barely knew her, and she invited me over to her place for a pretty awesome dinner, with her boyfriend. She is always a very inviting person, and you couldn’t help but really like her. Well fast forward to 6 months ago, I was on Facebook stalking Jess, and looking at all of her amazing travel pictures and stories. I decided to message her and tell her, she has inspired me to to the same. At that point I hadn’t told anyone I had made the decision to leave, but I did told Jess. Her email back was truly inspirational and I knew I must do this. Jessica met me at my hotel the next morning and I was so much in shock to see her again, I didn’t really even know what to say. The real Jessica is standing right here in front of me. Wow! We spend a few minutes catching up and then She decides to book a room in the same hotel and stay the night. 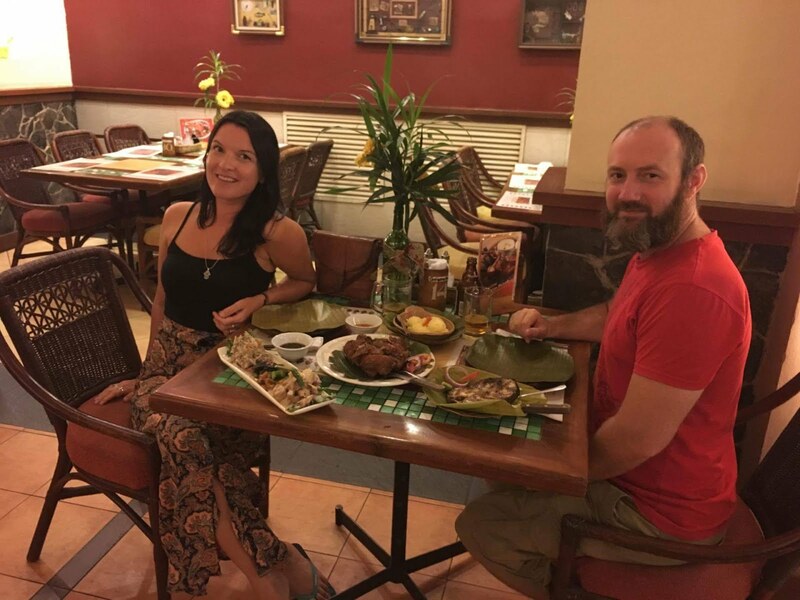 Well, that night Jess and I went out for a beer at a Irish Pub here in Cebu Philippines, and then off to dinner. Our dinner conversion was amazing, I love all of her stories. We share so many great things about our past and how we both got to this point. I hope in another 5 years we get to meet again, in another random country. The next morning Jess and I have breakfast together and then it happens. We have to say goodbye for now, once again. Jess, you are an inspiration to all, and I hope you will keep being the amazing person you are! Previous Previous post: Moalboal Philippines – Sardines and unexpected man crushes! GREAT CANADIANS!